These chairs have many typically Irish features. The pierced back is flatly carved with acanthus and Venus shells, and the arms terminate in outscrolling Jupiter eagle-heads. The compass-fronted seat has a waved apron following the Hogarthian 'line of beauty' and sits on characteristically Irish legs, with open elongated ear scrolls, acanthus-carved 'hocks', flat shell-enriched stretchers and claw feet. The chairs relate to a mid-18th Century chair now at Malahide Castle, Dublin and illustrated in G. Kenyon, The Irish Furniture at Malahide Castle, Dublin, 1994, pp. 92-93. The Malahide chair is the pattern for a lot of late 19th Century chairs made by Michael Butler of Dublin, including those in the Great Hall of The Castle. The Butler firm specialized in reproducing Irish 18th Century mahogany furniture as well as retailing furniture. A closely related triple-chairback settee by Butler was sold by the Earl of Iveagh, Elveden Hall, Thetford, Norfolk, Christie's house sale, 21-24 May 1984, lot 388. Butler were Lord Iveagh's principal furniture suppliers in the 1890s. 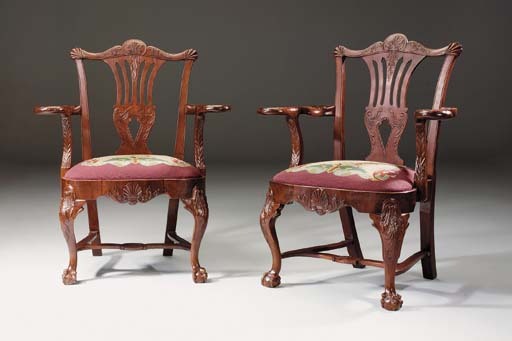 A further related chair was sold anonymously, Christie's New York, 13 October 1995, lot 243 and a very similar pair of chairs, but with paw feet, was sold anonymously, in these Rooms, 11 November 1999, lot 176.